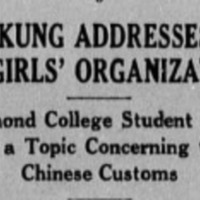 Column "Mr. Kung addresses girls' organization"
This column published in The Collegian on May 3, 1929, describes a Young Women's Christian Association event in which a Chinese student -- only referenced as Mr. Kung -- spoke on stereotypes that Americans had about the Chinese. According to the column, many of the women were "surprised that Chop Suey is not a Chinese dish and that marriages are sometimes made for love in China." The column ends by saying Mr. Kung helped teach the audience about "Eastern" life and understanding other people's ways of living. “Column "Mr. Kung addresses girls' organization",” Race & Racism at the University of Richmond, accessed April 18, 2019, https://memory.richmond.edu/items/show/1826.